and the Google Maps API, our elections team built a gadget that displayed province and district-level results in real-time “directly from the ballot box.” To facilitate this, we partnered with Cihan News who recruited 50,000 volunteers to provide real-time election data and received praise from voters and other media outlets for their quick and accessible reporting of election results. By making it easy for multiple collaborators to integrate data, create visualizations and work with a variety of data types, Fusion Tables allowed us to quickly build a prototype. We created tables with static content such as district shapes and names and separate tables with dynamic content such as the number of votes received and counted ballot boxes. We wrote a simple program to periodically parse Cihan’s XML feed of results and populate the dynamic content tables. We then were able to merge both the static and dynamic tables and visualize them directly in Fusion Tables without writing a single line of new code. As soon as Cihan uploaded the data, we were ready to visualize. The result was a quick and easy mashup that we could check for accuracy. We hosted the gadget off of Google Project Hosting. By 7:30 in the evening local time we were seeing over 500 queries per second to load the gadget’s static content from Project Hosting and over 1000 queries per second to load the gadget’s dynamic content from Fusion Tables - both astounding figures. 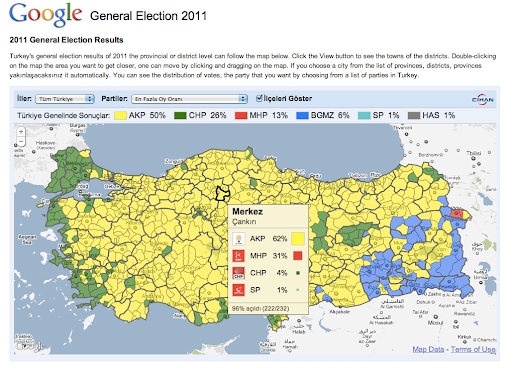 As evidenced by the volume of updates on Twitter and elsewhere on election night, Turkish voters were indeed eager to share the details of the election outcome courtesy of this custom mapping platform. Projects like this help people around the world view and explore information and also allow people to collaborate and merge different data sources. For instance, a tech savvy reporter could incorporate publicly available socioeconomic or past election data to the Fusion Table and use the Google Maps API to overlay the data directly onto the existing map. The web holds much promise to continue to transform politics and elections from a passive process to an active, participatory one. The elections team here at Google will continue to seek solutions and build tools and platforms to help inform and connect voters and candidates across the globe. As evidenced by this latest project, Google is committed to partnering with and helping news organizations succeed online and off. The Turkish election results gadget is the first of many election visualizations we hope to create in the future. Soon, we’re creating an election results specification so any news organization can provide the public data and can work with us to provide visualized and - importantly - searchable results on election day. We can’t wait to see what tools and products we can cook up together for elections around the world! Could anyone who knows the link of this map give it? I noticed the same speed as we were watching the results outside the country. Thanks Google thanks cihan news agency.